Have you heard of the Unofficial World Championship? It's a cute idea that developed as the TeamLiquid community wondered what StarCraft 2 would be like if it had a championship belt that changed hands with every win or loss. Naming GSL Season 1 as the first championship, fans have mapped out the line of champions over the entire span of professional StarCraft 2.
Who is the WORST PLAYER ON EARHT FDGOHFDGHF? NaNiwa's match against Tefel in Challenger League of WCS Europe 2013 is the obvious starting point when tracing this lineage. As one of the best non-Korean players to ever play the game, there's really no reason for us to doubt or challenge NaNiwa's judgment in this regard. 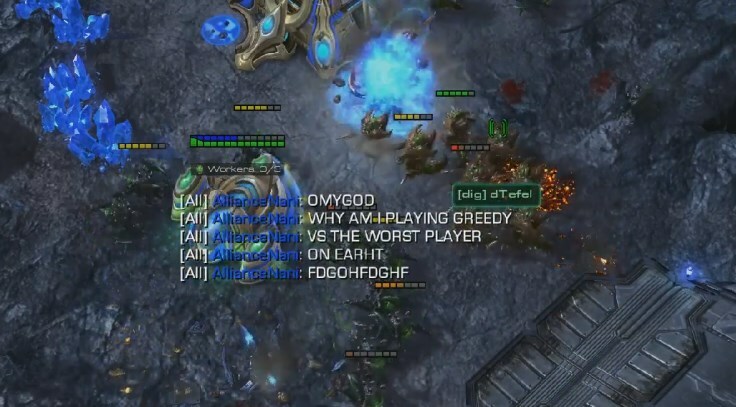 Unfortunately for Tefel, his reign as the first WORST PLAYER ON EARHT would come to a tragic end just one second later as NaNiwa immediately GG'd out of the game to take the title unto himself. After just seven days of holding the title of his own creation, NaNiwa would relinquish it in his first defense against Russian Protoss Siw. Despite NaNiwa's best efforts, he could not stop Siw and his less-stuff from GG'ing out against his more-stuff. Siw was able to hold onto the title for little more than an hour before giving it up to BlinG. The 1-2 score made the match the most closely contested one in the history of the title, with Siw able to take a consolation point by leaving his mineral line open to Dark Templars. But in the end, Siw was forced to receive the GG from the English Protoss. BlinG enjoyed a long reign as The Worst Player on Earht, holding the title for nearly a month due to a lack of challengers. However, once he was forced to defend the title, he dropped it with disappointing ease to German Protoss Ravage. Ravage became the first Worst Player on Earht to successfully defend his title, holding off an attempt from DaNa to take the title back to Poland. He then mounted a second successful defense, surviving a challenge from from countryman GoOdy. However, Ravage would finally meet his match in Italian Zerg grOPheR in the WCS Europe qualifiers. grOPheR went on to enjoy a lengthy reign that lasted over 10 months. With six title defenses, there is no question that grOPheR was the greatest Worst Player on Earht. However, no one can rule the Earht forever, and even grOPheR was forced to give up his title. Playing in the WCS Europe Season 2 qualifiers in 2013, grOPheR relinquished the title unto Polish player electro. Coming after the long and storied reign of grOPheR, electro has a lot to live up to. Can he live up to the standards set by his great predecessor? Or will he suffer the fate of Tefel, a fellow Polish Zerg and first Worst Player on Earht? Only time will tell. Omg list needs to be longer. Man back in 2012 Naniwa was the unofficial world champion, from that to worst player on earht is quite a development. anyone else really annoyed by the font used? It's straining my eyes for some reason >.> On the other hand, a good blog indeed. these guys from earht are so casul.